Lake Mary, Fla., August 8, 2011 – Soul Electronics, a global leader in pro and consumer audio manufacturing, has announced its premium, top-of-the-line, over-ear, noise cancelling headphones are now shipping nationwide – available in a trendy gold and black color combination or classic black and white. Retailers carrying the noise cancelling SL300 model include: BestBuy.com, Amazon.com, Buy.com, Brookstone.com, AAFES.com, Microsoft, Huppins, Vann’s, Target.com, RadioShack, Bobbizzo.com, MacMall.com and Headphones.com. Made in collaboration with Grammy award winning artist and newly released Fast Five star, Chris “Ludacris” Bridges, the SL300s complete the five-model round-up in this elite series of high-performance over-ear, on-ear and in-ear headphones. The SL300 model offers superior noise cancellation technology combined with sleek style and professional sound. The comfortable over-ear design seals in sound and blocks out ambient noise, for a truly private listening experience. It boasts powerful sound amplification for studio quality balance of deep bass and crystal clear mids and highs. The convenient foldable design and hard protective case makes these the ideal headphones for the on-the-go music professional or elite traveler. Plus, it comes with a 3.5 mm to ¼ inch adaptor for easy transitioning from MP3 players to amps. The premium Gold or Black/White color combinations add distinctive style and unique flair. 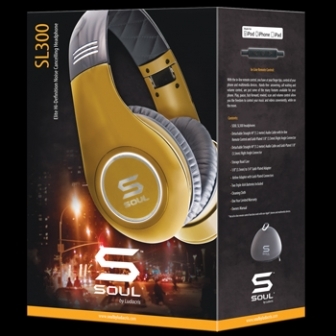 The SOUL by Ludacris line features the elite High Definition SL300 Powered Noise Cancelling headphone, High Definition On-Ear models SL150 and SL100, and the SL99 and SL49 High Definition In-Ear headphones. The SL150 model features an on-ear design for professional sound and distinct personal style. Engineered for powerful deep bass with mid and high clarity, these foldable headphones feature a Chrome-on-Black color combination as a well as a White-on-Black option. The SL100 model is a more compact on-ear headphone option. But don’t let the smaller size fool you. These high-definition headphones deliver big sound with stylish urban aesthetics, engineered with the perfect balance of bass, mids and highs. Plus, the Red-on-Black and Blue-on-Black combinations bring a splash of color to the line. For in-ear music enthusiasts, the SL99 and SL49 models offer high-definition sound in a tangle-free design. Both in-ear headphone models feature high-precision audio balance for the perfect blend of sound characteristics. They also include small, medium and large replacement ear tips for the ideal fit. The SL99 offer supreme sound isolating qualities for extra privacy. The entire SOUL by Ludacris line contains professionally voiced sound technology with advanced circuitry and drivers designed by a team of engineers who have developed some of the most notable acoustic breakthroughs in the audio industry. All models feature gold-plated connectors for seamless signal transfer and come iPhone® Ready, which means they work with iPhones, iPads and iPods. SOUL by Ludacris® products are now available nationwide at Apple.com, Amazon.com, BestBuy.com, Headphones.com, Brookstone, Buy.com, Bobizzo.com, AAFES, InMotion, MacMall, Microsoft Store, Huppin’s OneCall, Ovation and Vann’s. Pricing is as follows: SL300 - $299; SL150 - $199; SL100 - $149; SL99 - $99; SL49 - $69, and product assortments and availability varies with each retail partner. That headphone looks great. I wonder how it compares to the Dre line?